Home Good Website Investment Porfolio Make Money Online Money Useful HOW TO: Create Your Free Indian Investment Portfolio online. 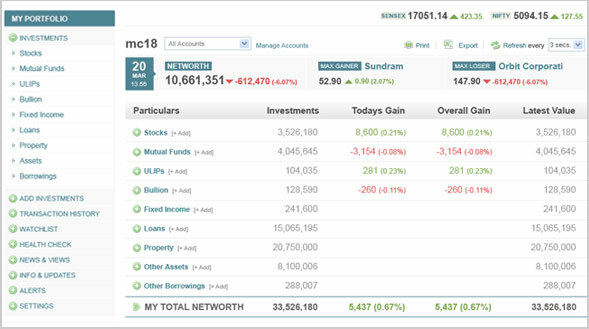 HOW TO: Create Your Free Indian Investment Portfolio online. Many people from India do trading in share market, inter day, intraday. People buy Mutual Funds and also invest in debts, but they fail to keep a track of things. Having an online portfolio immediately gives you the overall health of your investments and also helps in taking corrective action. This tip is especially for Indians who have done investments in various financial products like Insurance, Mutual Funds, Debts (PF, PPF). I am going to show you how to create your own online portfolio for free. Follow the simple steps to get your own portfolio. 4. Start adding your investments. Once you have added your investments you will immediately find overall health of all your investments and also find which area is performing best and which one the worst. You can easily take corrective action in worst performing assets and secure your money and future. All the best and happy Money making.